Native Americans Propose Change To Yellowstone Landmark Names The U.S. Board on Geographic Names is considering renaming a mountain and a valley in Yellowstone. The park features are named for men whose work was tied to mass killings of Native people. 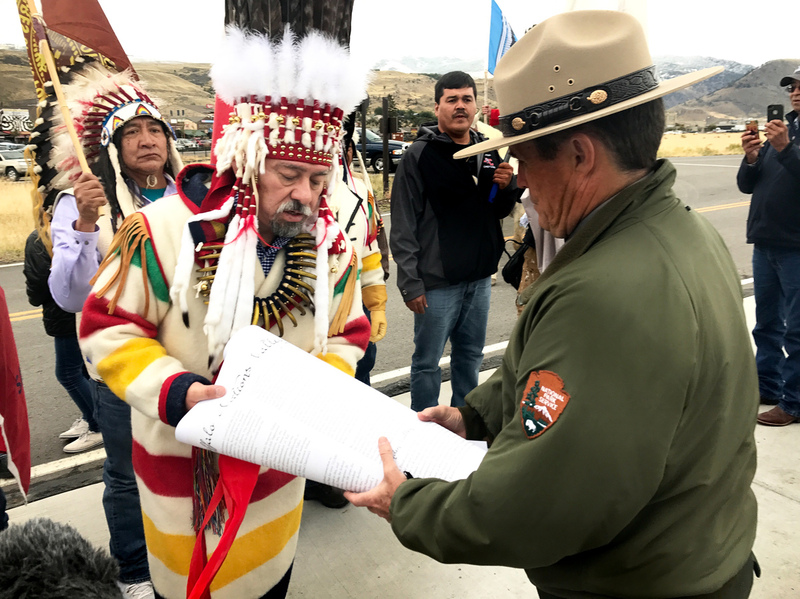 Chief Stanley Charles Grier of the Piikani Nation hands over a declaration to Yellowstone National Park deputy superintendent Pat Kenney. On a cold January day more than a century ago, U.S. troops massacred nearly 200 Piikani people on a Montana river bank. Most were women, children and old folks. "It's hard to imagine," Chief Stanley Charles Grier of the Piikani Nation in Alberta, Canada said. The people killed were his ancestors and accounts of the massacre are brutal. Soldiers killed a mother breastfeeding her baby. They shot sick people hiding under blankets. "Survivors were basically executed by axes," Grier says. "That's pretty barbaric." The man who helped perpetrate this massacre was Army Lt. Gustavus Doane. He later went on to explore parts of Yellowstone and his compatriots named Mount Doane after him. The name stuck, and Grier wants to change it. "Lieutenant Doane led that attack and fully implemented the massacre," he says. "We feel that's an atrocity to humanity and it's essentially a war crime." Massacres like this were a major part of what some historians call a forgotten genocide during the colonization and settlement of the American West. The perpetrators of these massacres were sometimes honored with mountains, valleys and towns. Take U.S. Army General William Harney. He was nicknamed "Woman Killer" after he helped massacre nearly 100 Lakota in 1855. But a mountain named after him was renamed in 2016. Now tribes are trying to do something similar in Yellowstone National Park. Last September, leaders from across North America gathered there and asked the federal government to change the name of Mount Doane to First Peoples Mountain. They also want to rename the iconic Hayden Valley. The person it's named after was one of the first surveyors of Yellowstone, Ferdinand Hayden. He compiled a geological survey that called for the extermination of American Indians. "He basically incited this hatred towards indigenous peoples at that time in his policies and in his written statements," Grier says. But earlier this year, Park County commissioners in Wyoming voted against changing Mount Doane and Hayden Valley. They said people there like the names. They're used to them. "This has nothing to do with the Native Americans," Jake Fulkerson, vice chairman of the Park County commissioners, says. "There was one article we saw that said commissioners against the Indians or something and that's garbage." According to Fulkerson, the whole issue is overblown. "If you go around digging up dirt on people and changing names everywhere, I mean, once this horse leaves the barn, where does it end?" he says. But he and the other county commissioners don't make the ultimate decision. They can only make a recommendation to a federal body that will. It's called the U.S. Board On Geographic Names. "No one thinks about geographic names until someone wants to change one of the names they're familiar with," executive secretary Lou Yost says. "Then everyone gets all emotional." He said the board gets about a dozen or so controversial name changes like this every year. When they're trying to make these kind of decisions, they'll ask for recommendations from federal agencies and state, county, and tribal governments. The board's researchers also compile historical documents and corroborate accusations. In Gustavus Doane's case, they found mountains of evidence against him. Grier said erasing Doane's name from Yellowstone is a long time coming. "It's really meant to represent justice," he says. The board is still waiting on a recommendation from the National Park Service but Yost said it could make a final decision on the Yellowstone landmarks as early as this fall.